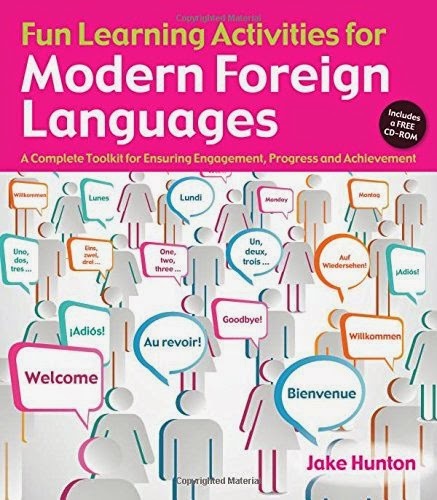 This is a review of Jake Hunton's book Fun Learning Activities for Modern Foreign Languages (Crown House Publishing Ltd, £19.99 inc. CD Rom). I am grateful to him for having a copy sent to me. 1. An introduction explaining the philosophy behind Jake's ideas - how he came to formulate his activities. He explains how, through experience, he evolved sets of activities which engage pupils and allow them to retain much more language than they had with traditional methods he had previously been using. How could he get children to remember more words for the exam? He sees vocabulary knowledge as fundamental to proficiency. He draws on Hattie's Visible Learning research and the theory of spaced practice and introduces the reader to his two key acronyms: VFLAs (Vocabulary Fun Learning Activities) and FLAs (Fun Learning Activities). 2. In Chapter 2 Jake writes about Magic Whiteboards and mini-whiteboards. The former can be stuck on surfaces around the classroom (walls, windows, cupboards, doors) and allow students to write up model answers for other pupils to see, create mini-classrooms within a classroom, create a "gallery of work in progress" and be a variation on the traditional way of having students hold up their mini-whiteboards to the teacher. Jake uses both types of whiteboards for many of his VFLAs and FLAs. 3/4. Jake next introduces and describes his VFLAs. He explains 18 separate activities with intriguing names such Bob-Up Classic, Mexican Wave, Vhispers, Vlotto and Mimey Mimey. He explains that the philosophy behind all the games is that as many pupils as possible are involved and that the teacher should use whatever means possible to show as much language as possible to students. Jake prefers to go beyond single words wherever possible. Just to give you one example: in Bob-Up Classic Jake shows a Powerpoint slide with 13 TL sentences relating to personal descriptions; e.g. J'ai les cheveux blonds; J'ai les yeux verts. The class is divided in two with each half having a captain (who gets to wear a football captain's armband). The captain distributes cards with numbers on them, 1-13, one to each pupil on each team. The teacher calls out a number at random and whoever has that number on each team has to "bob up" and say the phrase in TL and translate it into English. The quickest student wins a point for the team. Jake stresses that this is not a frivolous game and that it helps with retrieval of previously learned language beyond the single word level. I can certainly imagine it working well. Jake correctly notes that boys in particular tend to respond well to competitive games. The other 17 VFLAs are explained in detail, with variations offered. In Random Random it is easy to show how games based on individual words can generate paragraph length target language. Mexican Wave looks like a noisy and exciting way to start a lesson - the teacher will need, as with other games in the book, to have a good rapport with the class and firm class control. Not all of the games are teacher-centred - Toy Time involves groups of four pupils passing around a soft toy. Verbal Volley is done in pairs and played at speed. 5. Chapter 5 lists no less than 40 FLAs (Fun Learning Activities, remember?). Some take 10 or 15 minutes, others a whole lesson. Titles include Pic 'n' Mix, The Three Amigos, Walkie-Talkies and Mobile Phun. I'll leave you to imagine how these games might go. Jake explains how he has sometimes adapted his games from others he has seen, sometimes in other subject areas. Here is an example: Relay. In this activity a dozen or so numbered English sentences are written on separate pieces of paper. Students form groups of three or four and assign themselves roles: scribe, runner (takes the translation to the teacher) and two researchers (who consult textbooks and dictionaries). The teacher goes to each group, hands them a one of the pieces of paper, says "Go!" and the groups have to race to see who can get the TL translation to you on a mini-whiteboard (you could use rough paper). Whilst I have reservations about the reliance on translation in this game (I would normally prefer to keep the lesson in TL as much as possible), I can see how this game would embed language and be motivational. It's simple and effective. Running dictation was a favourite in my own narrow repertoire of games, so I know how competition motivates and gets pupils to work at speed. 6. Chapter 6 looks a bit more at the benefits of "spaced learning" and offers to examples of how a teacher might plan a sequence of lessons to make the most of spaced practice. Jake is on to something powerful here. A good textbook builds in an element of constant revision, but with the poor timetabling languages often gets these days in schools, regular spaced practice can be hard to achieve. It needs to be planned for. 7. Chapter 7 lists 10 maxims Jake chooses to follow. They all make good sense. I like this one: talk to the students about why you are doing an activity. "Sell the rationale" to students and be positive. I wonder if teachers do this enough. 8. Jake briefly shows how VFLAs might be adapted to other subjects and then make some concluding comments. I like this book. I would happily try out most of the games. They are adaptable to various age groups and abilities. I would have the book in my departmental library for colleagues - if you don't have such a small library, why not start one? Looking at individual activities would make a good activity for departmental meetings and stimulate teachers to come up with their own ideas. Not all the games will suit every teacher and every group, and, let's face it, you don't have to do games to teach well - good classroom control is a prerequisite, but as lists of games goes, this is a very good one, supported by some sound pedagogical theory. Thank you for leaving a comment. Yes, it's a good book for a departmental library.